Mary Ledman, global strategist for dairy at Rabobank, speaks at the Dairy Forum held Jan. 20-23 in Orlando, Fla. Seated behind her are Phil Plourd, left, president of Blimling and Associates, and Marin Bozic, assistant professor in the Department of Applied Economics at the University of Minnesota. 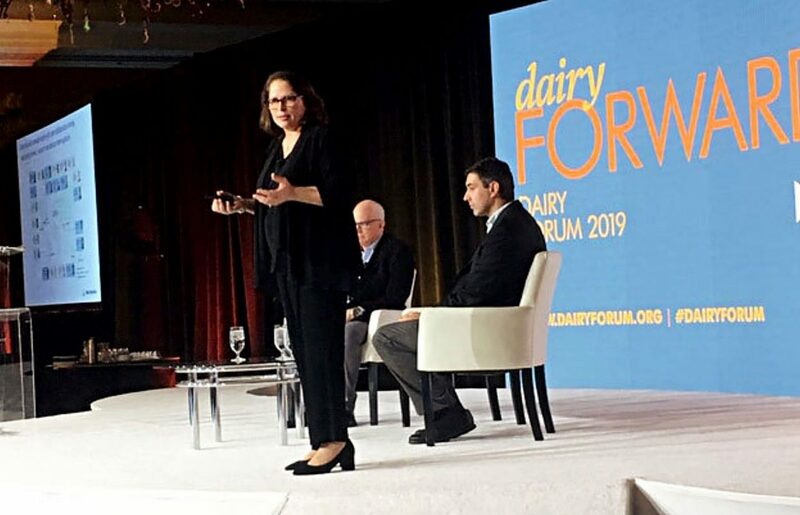 ORLANDO, Fla. – Robert Johansson, the Agriculture Department's chief economist, was scheduled to discuss where dairy markets are headed at the Dairy Forum here Tuesday, but the government shutdown prevented his travel and other economists gave their views instead. Mary Ledman, global strategist for dairy at Rabobank, the Dutch-based international agricultural bank, said that journalistic coverage indicating that the U.S. dairy sector is in deep trouble due to declining fluid milk consumption is wrong. "We have a new consumer out there," Ledman said, noting that volume sales of alcohol and juices have also declined. "While it is true that Americans are drinking less milk, demand for other U.S.-produced dairy products continues to grow. Domestically, Americans are eating more cheese, yogurt and butter, which more than offsets declines in fluid milk consumption. The industry is not dying," she said. According to USDA data, she explained, Americans drank 149 pounds of milk per capita in 2017, down from 247 pounds in 1975. Over the same period, per capita consumption of cheese grew from 14.3 pounds to 36.9 pounds. The 22.6-pound increase in per capita cheese consumption over this period equates to 226 pounds of milk because it takes about 10 pounds of milk to produce a pound of cheese. As a result, the 98-pound annual decrease in fluid milk consumption has been more than offset by the 226-pound increase in milk used to manufacture cheese, she said. The increase in cheese production has increased the demand for butterfat, and farmers have responded by breeding cows that produce more butterfat, she noted. "To feed the cheese engine, we are going to have to add butterfat," she said. Lower milk prices in 2018 – the lowest price since 2010 – contributed to the bump in cheese stocks. "Manufacturers of aging cheeses, such as aged cheddar, took advantage of the opportunity to put cheese that will be cured for several months, or even several years, in storage," Ledman said. The rest of the world is also demanding more U.S. dairy products, she added. Higher stocks and lower-than-expected cheese exports to Mexico have contributed to weaker domestic cheese prices, particularly in the second half of 2018 and into 2019. "This means that consumers are unlikely to face any sticker shock when stocking up on cheese for their annual February Super Bowl parties," she said. But Ledman warned that Rabobank is worried about the possibility of a recession later this year, which could lead to a decline in dairy prices. Marin Bozic, an assistant professor in the Department of Applied Economics at the University of Minnesota, said the impact of the new dairy program in the farm bill is uncertain. The new program is likely to keep a lot of smaller dairy farmers in business, and the percentage of dairy covered under the program may rise from 40 to 50 percent, similar to the level of crops covered under crop insurance. Whether that should be considered a "safety net" or a "safety cocoon" that shields farmers from the impact of the market has yet to be seen, he said. But Bozic said he wonders if it will remain in the U.S. interest to maintain a stable world order for trade. U.S. agricultural exports are only a tiny portion of exports to China, he said. The United States is already self-sufficient in food, is becoming self-sufficient in energy and may be able to bring back manufacturing through the use of robots, he said. Under those circumstances, he added, it may not be in the larger U.S. interest to protect global supply chains. In current trade negotiation, Bozic said, the United States is likely to get back the Mexican market currently damaged by the tariffs imposed on steel and aluminum, "but dairy exports to Asia may be collateral damage." In a separate presentation, Torsten Hemme, managing director of the International Farm Comparison Network at Kiel University in Germany, said that whether the United States is a major exporter of dairy products depends on the world price of milk. Milk processing is currently concentrated in the United States and Europe, but there is lots of opportunity for firms that are willing to open plants in South America, Africa and Asia, he said. In tropical countries, Hemme said, the question is whether countries should be considered self-sufficient if they process most of their dairy products but depend on imports to feed the cows. India and Pakistan are the countries growing fastest in dairy production, but the average number of dairy cows on a farm in India and Pakistan is three. That creates a challenge for processors, Hemme said. But he asked the dairy executives, "If your company wants to be a global dairy company, can you afford not to be in India?"